Cukote‟s high loading of cuprous oxide makes this formulation a top performer, even in the most severe fouling areas. As an ablative, self-polishing coating, there is no buildup of bottom paint over time. Your hull’s underwater surface remains smooth and clean. Cukote copolymer can also withstand removal from water without affecting its antifouling properties. 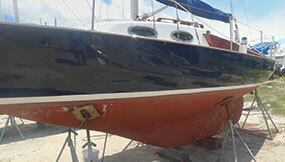 Cukote is the premium self-polishing antifouling paint that has established the standard in the industry. Exceptional racing finish paints AND superior antifouling protection. “Four years ago I commissioned the refit of a 1965 Pearson Commander at Gulf Coast Complete in Kemah, Texas. Dave Whelan, the President, recommended that we use Sea Hawk’s Cukote antifouling on the hull bottom. After 40 yrs of salt water sailing and too many boats to mention here, I must say that I had not heard of Sea Hawk Paints. I hauled the boat for the first time and really expected to see a mess. What a surprise. After a light pressure wash to remove a light layer of slime, the bottom looked like it could go right back in the water. I can’t tell you how pleased I am with this paint. While Rockport,Texas, is noted for some of the toughest salt water hull growth conditions along the coast, it was no match for Cukote.